Space. It seems to go on forever. But then you get to the end and a giant turtle spits fire at you. In fact... in most Mario titles you get to the end and a giant turtle spits fire at you, but that's not the important part. Back when Mario hit the scene in the mid 80's he was a big deal. In fact the original Super Mario Bros. is such a classic that many remember it as their first adventure in to the world of Nintendo. Super Mario Bros. 2 was quite different and bizarre (probably because it was really a reskinned version of Doki Doki Panic), but still found an adoring audience. The real game changer (all puns intended) was Super Mario Bros. 3, a title that was so unique and brought so much character to the Mushroom Kingdom that to this day many hail it as one of the greatest games of all time. Flash forward to 1996. The Nintendo 64 launches alongside one of the greatest 3D platformers to ever grace the small screen. Pilot Wings 64. No, wait that isn't it... *cough* I mean, Super Mario 64. The launch title that had player running in all sorts of new directions and cursing monkeys everywhere for stealing their hat. To me, Mario 64 was the Super Mario Bros of a new era. A classic in every respect that just about everyone had, at some point in their life, played and loved. The next big Mario adventure was Super Mario Sunshine for the GameCube. A title that, much like Super Mario Bros. 2, took a step in an interesting direction that some loved and others hated. 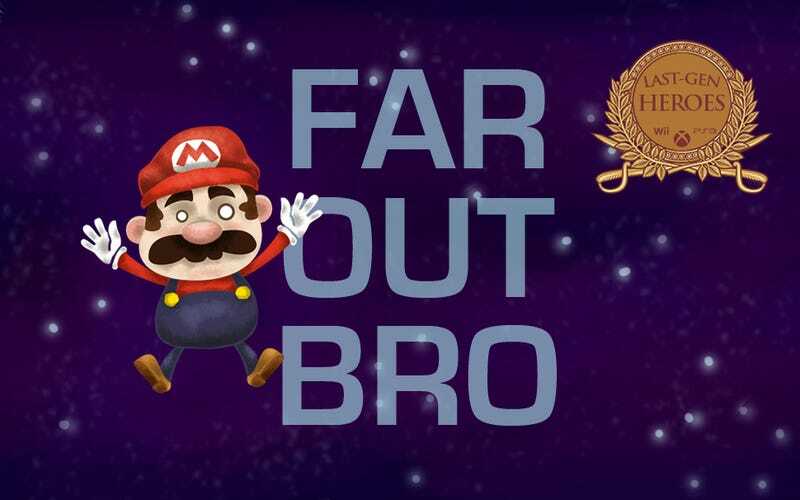 A game that wasn't quite as well liked overall, but still gave players a new take on Mario. Then came Super Mario Galaxy on the Wii. The Super Mario Bros 3. of the 3D Mario era. A game so full of fresh ideas and classic throw backs that it topped the charts and currently holds rank as the best reviewed game of all time (if you care about that kind of thing). Super Mario Galaxy is the perfect example of a game that knew what its fans wanted and pushed the envelope just enough to make the classic "rescue the princess" adventure seem new again. It's also the perfect example of how much waggle to put in a Wii game. Motion controls can certainly make a game more complicated than it needs to be or feel tacked on, but Galaxy found the sweet spot. Pointing at the screen to collect star bits was fun because they weren't technically part of the core gameplay, they were simply a shiny bonus that helped you unlock new worlds at your own leisure. With a quick shake of the Wiimote Mario could spin around, knocking enemies for a loop, launching him into the stratosphere or screwing down some... loose... screws. Admit it, you loved that part. Despite the occasional vertigo, Galaxy's level design was also a wonder to behold. Instead of the usual immense hunk of land with invisible barriers, we were treated to a plethora of tiny worlds to explore. How do I get off this planet? Do I simply jump and let the orbit take me? Do I shoot off with the help of a star ring? Can I go INSIDE the planet? The levels had so much variety and yet somehow always led you in the right direction. Getting constantly lost in a game is a frustratingly terrible way to ruin a perfectly good adventure, but Galaxy found a way to push players to where they needed to be. Not only that, but it made you feel smart for having found the right path (usually) without any unnecessary hand holding. Galaxy is best known as a wonderful solo adventure, but it's also the perfect game for couples or gaming teams who are a little one sided. My wife (who drew the lovely Mario you see at the top) likes to watch me play adventure games, but rarely plays them herself. Being able to simply control Mario's little star buddy, she could help my progress without hindering me in any way. She could contribute to my my star bits without stealing them away for herself. She could stop enemies and delay falling object with just enough accuracy to help me reach new areas and conquer new levels. It's a game that brought us closer together in the early days of our relationship. So here's to you Super Mario Galaxy. You made the Wii a system worth owning and you showed the world that a long overused franchise could still innovate the world of gaming. Lead image by Bethany Bertoli - Click here to see it in motion.